Honor’s latest affordable flagship has an 18:9 display and dual-camera capabilities — for (probably) less than you’d expect. Honor’s “X” series of phones has always toed a fine line in terms of hardware, feature set and price point. The Honor 5X was one of the first handsets to bring metal construction and fingerprint recognition to a cheaper price tier. And a year ago, the Honor 6X added a surprisingly competent dual camera rig to the experience. As 2017 draws to a close, the Honor 7X makes things even more competitive. The new phone has been soft-announced announced today ahead of Honor’s full launch event on December 5, and assuming it keeps to a price point in line with its predecessors, it could be one of the most compelling sub-€300 phones we’ve seen. Starting on the outside, the Honor 7X broadly resembles a mash-up between an Honor 8 Pro and a Huawei Mate 10 Pro. It boasts a new, taller 18:9 aspect ratio, with a 5.93-inch Full HD+ (2160×1080) LCD panel — a first for what we assume will be something priced similarly to the 6X. You could argue about whether, like the 6X and 5X, the design is a bit derivative. What’s more important is that there’s nothing at all cheap-feeling about this phone. Around the front, the 2.5D glass of the display finally has an oleophobic coating, which sounds like a small thing, but is hugely important in stopping the screen getting gunked up by fingerprints. That’s aside from the tall aspect ratio that gives makes phone just as modern-looking as a OnePlus 5T or LG V30. The premium design and brushed finish of the Honor 7X takes a step beyond 6X and 5X. Fortunately, the flagship-like aesthetics of the Honor 7X don’t come at the cost of durability. While Honor isn’t advertising the phone as being drop-resistant in the same way as a Moto Z2 Force, the 7X does boast reinforced corners — the main impact point for any drop — to reduce the likelihood of permanent damage if it hits the floor. I haven’t put this to the test with my unit (yet), but I did witness the phone survive a few impromptu drop tests at a meeting in London ahead of today’s announcement. On the inside, the Honor 7X runs the latest of Huawei‘s mid-level Kirin chips, the Kirin 659 — an octa-core 16nm part, along with 4GB of RAM and (in the UK) 64GB of storage, plus microSD. Like many other dual-SIM phones, the 7X‘s hybrid slot can support either a single SIM plus SD Card, or two SIMs and no SD card. A solid loadout of specs — though you'll be dealing with Android Nougat out of the box. We haven’t spent a whole lot of time with the Honor 7X‘s cameras just yet — look out for our full review for a more comprehensive take — but the handful of indoor shots I took in a dimly-lit breakfast bar looked decent. The Honor 7X‘s photos looked a little smudgier than pics from a Huawei Mate 10 Pro I was also carrying — nevertheless, the cheaper device managed to hold its own. Around the front, there’s an 8-megapixel setup that’s also capable of capturing portrait mode shots — a feature that’s only just starting to gain prominence in the Android world. There are a few compromises hidden away in the 7X‘s attractive chassis, though. It charges over microUSB, a decision which presumably saves money, but seems bizarre for any phone in late 2017. And quick charging is limited to 5V/2A with the built-in plug. There is at least a 3.5mm headphone jack, which supports audio enhancements through Huawei‘s HiSten tuning technology. And the 7X promises at least decent longevity, thanks to the same 3,340mAh internal battery capacity that served the 6X well. That’s nothing to write home about in the flagship space, but should be plenty for a device like the 7X, running lower-powered silicon. 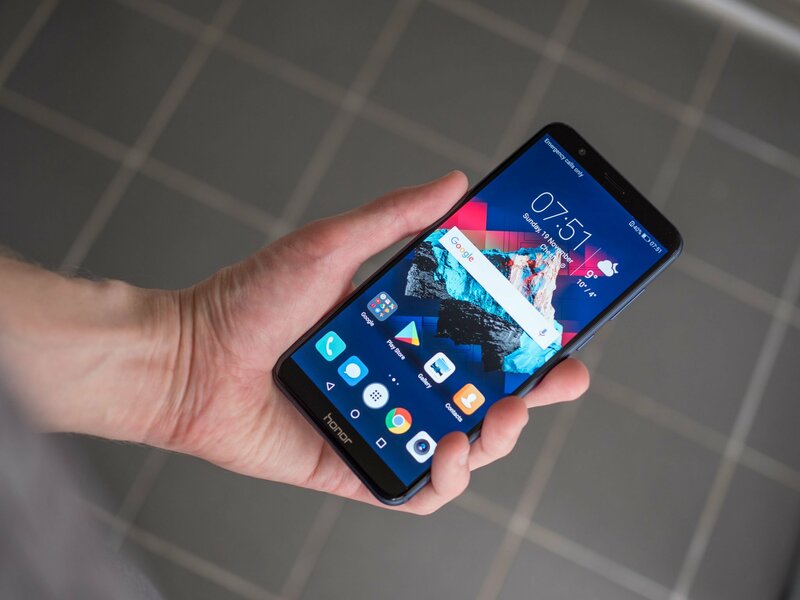 On the software side, the compromises of running a mid-range chip are also apparent: The Honor 7X runs the older EMUI 5.1, based on Android 7.0 Nougat, as opposed to the newer EMUI 8 found in Kirin 970-powered handsets. Visually, this doesn’t make a whole lot of difference, and Honor has even ported some of EMUI 8’s more useful features back to the older software. Apps that don’t support 18:9 natively can easily be scaled up to fill the full size of the display. And some messaging apps can (optionally) open messages in a split-screen view if you’re watching full-screen video. Besides that, this is EMUI 5.1 just as we’ve seen it on a number of phones over the past twelve months. It’s an improvement on what came before, with a clean blue-and-white color scheme, but there’s still some software weirdness, including a suboptimal lock screen notification system. We’ll learn more about pricing and availability for the Honor 7X on December 5. Any device shipping with Nougat at this stage is less than ideal, though in the case of what (likely) will be a cheaper handset, it’s not the end of the world. Honor says it’s planning to update the 7X to Android 8.0 Oreo and EMUI 8 in the first quarter of 2018, but it’s not going into specific dates just yet. Honor isn’t announcing pricing details for the 7X until the December event, but considering the starting price of the 6X, and the hardware included in the new phone, you might expect a price comfortably within the sub-€300 ballpark. Stay tuned for our full Honor 7X review, along with coverage from the launch event on December 5. J5create USB 3.1 TYPE-C TO TYPE-A ADAPTER (JUCX05) Gear S3 Value Pack Update: Timeless Outside. Even More Revolutionary Inside.